Suite Alimuri is a charming dwelling of about 60 sq. m. and it can sleep up to 4 people. 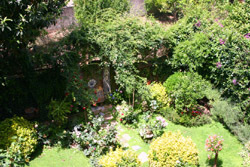 It is situated in a quiet area, in a typical ancient street in Meta di Sorrento near the beach "Alimuri Beach". The neighbourhood, where the apartment is, is called "Casale", and it is one of the most ancient and aristocratic in Meta di Sorrento. This house has just been renewed and it is provided with modern household appliances, but at the same time it is located in an ancient building dating back to the XVIII century (no lift). This apartment is near a lot of shops: a supermarket, a greengrocer’s, a confectioner’s, a butcher’s, a chemist’s, some restaurants, etc., and at the same time, it is in a very quiet area of Meta di Sorrento. If reaching the "Suite Alimuri" by car, in the vicinity of the apartment is a private carpark. The bus stop is 50 m. away and public buses pass every 20 munites to go quikly to Sorrento and the other places of the Sorrento Peninsula. The nearest beach is "Alimuri Beach", which is 400 m. away: it can be reached on foot, but on the way back there is a steep slope up. Anyway near the apartment there is a public lift to reach the beach. If one decides to go by car, there is a car park there. That beach is a typical fishermen’s village and on the west-side of it is a sandy beach where umbrellas, deckchairs, a bar are available and where kids can safely swim. Otherwise, on the east-side of the beach there is a pebbly beach. Curiosity: the best pizzas in the area can be found at "Tico Tico" Restaurant near “Alimuri beach” (400 m. away from the house). To reach the Suite Alimuri, one has to walk for 50 m. along an ancient narrow street, typical in our area during the XVIII and XIX centuries, and then enter through a door that opens in a porch and then in an ancient courtyard: in front there are plants and flowers, whilst on the right and on the left the courtyard is embellished with big decoration in majolica tiles. 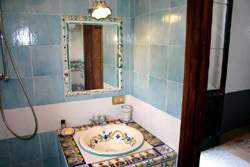 Suite Alimuri, and actually the whole bulding, is decorated with marvellous majolica tiles, made by local skilled craftsmen. Nobility of Meta di Sorrento (and in general of the Sorrento Peninsula) used to live in big buildings like this one where on the ground floor, in the most part of the cases, were stables with horses and coaches. 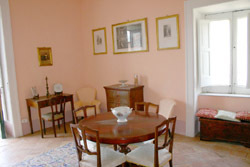 Another part of the ground floor was reserved to the servants whilst the masters lived on the first and second floors. Buildings like this one are considered historical monuments and they lie within the competence of the Ministery of the Cultural Heritage. 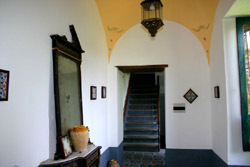 Steps, decorated with hand-painted majolica and with railings made of iron, take upstairs. On the first floor there is a small terrace, which belongs only to the flat. On the left there is the bathroom with a shower, nicely decorated with ceramic tiles. 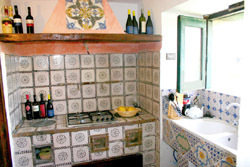 The kitchen too is decorated with ceramic tiles, and it is ancient. But at the same time it is equipped with modern cooking stoves and a refrigerator. On the other side of the house is the bedroom with a double-bed and a big wardrobe: from its window one can enjoy a beautiful sea-view. 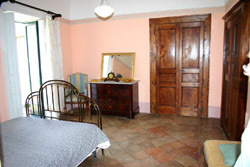 This room is decorated with antiques and the bed in wrought iron. The nearby living-room is decorated with antiques dating back to the XVIII and XIX centuries, and it is equipped with TV, table with chairs and a sofa-bed for 2 people. But the “magic moment” of the day is at sunset in the courtyard, when all the roofs, which surround the building, become redder and redder and the sea in the distance becomes darker and darker. Suite Alimuri is a great place for those who love to enjoy nature and sun and for those willing to explore the coast of Sorrento and the Amalfi Coast. From this flat one can easily take a train to reach Naples, Pompeii, Sorrento and the other nearby tourist attractions of the area.